cARds Counter is an Augmented Reality mobile application used to project card information ontop of traditional playing cards. 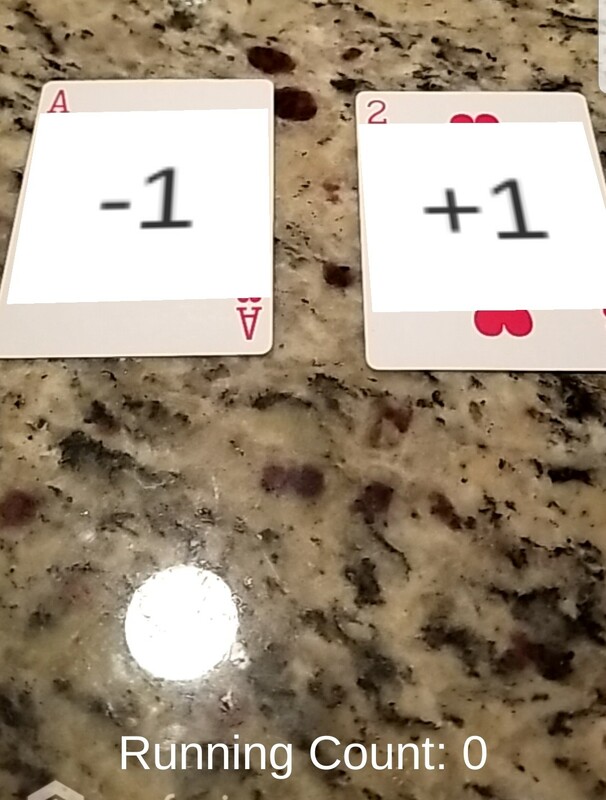 In the game of blackjack, there is the idea of counting cards where the player has the advantage over the dealer if there is a ratio of more high cards than low cards in a deck of cards. cARds projects card counting information on the playing cards and keeps a running count of how many cards have passed through the camera. cARds Counter is an Augmented Reality mobile application used to project card information ontop of traditional playing cards. In the game of blackjack, there is the idea of counting cards where the player has the advantage over the dealer if there is a ratio of more high cards than low cards in the deck. cARds projects card counting information on the playing cards and keeps a running count of how many cards have passed through the camera. cARds Counter was made using the Unity Game Engine for the backbone of the game development and Vuforia Engine for the most cutting edge platform for Augmented Reality Applications. Using Vuforia’s Image Target API it is fairly easy to project card information ontop of card images that are predefined in their image database.